Sierra Entertainment is looking to give TimeShift players a boost today as they announce the availability of the Futures-Past Multiplayer Map Pack on Xbox Live today. The pack contains five new maps playable in any of the games myriad multiplayer modes, from the mundane deathmatch to the relatively entertaining King of Time mode. The pack will cost you absolutely nothing to download, as Sierra is most likely desperately trying to drum up interest for the game, a solid title that had the misfortune of being delayed to the point where they had to release it between Halo 3 and Call of Duty 4, effectively ensuring that the multiplayer audience for the title would be far too busy doing other, more important things. It's ironic how horribly time has treated TimeShift. I'm just glad they didn't release this map pack within weeks of another blockbuster game with amazing multiplayer was released. Oh wait. TIRED OF THE SAME OLD TEAM DEATHMATCH? 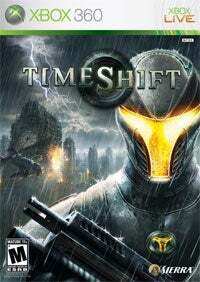 Sierra Entertainment today revealed plans to launch the Futures-Past Multiplayer Map Pack, a new downloadable content (DLC) package for TimeShift™ for the Xbox 360® video game and entertainment system from Microsoft®, available for free download on 9th May 2008. The map pack features five new multiplayer maps for players to unravel while annihilating online enemies with time-bending chrono grenades. Each map presented in the DLC package supports classic multiplayer modes: One-on-One, Deathmatch, and Team Deathmatch, but TimeShift's exclusive multiplayer modes, King of Time and Meltdown Madness modes reveal the future of multiplayer fragging. For more information on downloadable content package, Futures-Past Multiplayer Map Pack, be sure to visit the official website at www.timeshiftgame.com.